Today is the 7th anniversary of Houston Strategies. After 947 posts (cream of the crop here), almost half a million visitors, and thousands of comments in an epic dialogue about Houston, I thought this would be a good time stand back, look at the big picture, and ask "What should be next for Houston?" while linking back to some of the gems from that archive. First, let's look at where we are currently. Our foundation is in great shape. Houston has started the 21st-century with a set of rankings and amenities 99% of the planet’s cities would kill for: a vibrant core with several hundred thousand jobs; a profitable and growing set of major industry clusters (Energy, the Texas Medical Center, the Port); the second-most Fortune 500 headquarters in the country; top-notch museums, festivals, theater, arts and cultural organizations; major league sports and stadiums; a revitalized downtown; astonishing affordability (especially housing); a culture of openness, friendliness, opportunity, and charity (reinforced by Katrina); the most diverse major city in America; a young and growing population (fastest in the country); progressiveness; entrepreneurial energy and optimism; efficient and business-friendly local government; regional unity; a smorgasbord of tasty and inexpensive international restaurants; and tremendous mobility infrastructure (including the freeway and transit networks, railroads, the port, and a set of truly world-class hub airports). We offer a "best of both worlds" between a big, multi-ethnic, international city with great amenities, culture, and opportunities, while also being affordable and fast-growing with a feeling of community (the "big small town"). With all that, it's really easy to get complacent. In fact, in some ways I think we might be coasting a bit now. But coasting is definitely not how we got here. Big initiatives are a proud tradition here: dredging the original port, founding the Texas Medical Center, establishing the Johnson Space Center, and being the first in the world to build a gigantic, futuristic, multi-purpose domed stadium - just to name a few examples. But what should be next? Where should the world's Energy Capital put its energy, so to speak? I was recently inspired by the Urbanophile's post on Indianapolis' 40-year economic development and tourism strategy built around sports. Starting with nothing but the Indy 500 they've built a string of wins all the way up to hosting one of the most successful Super Bowls ever last month. We need that same sort of sustained, long-term strategy that goes beyond specific projects to a theme we can weave into everything we do over the decades ahead. We need to take the energy boom we're currently enjoying and invest it to secure our long-term prosperity no matter how technology shifts in the future (most especially energy technology). In particular, I think we should focus on applied STEM - systems-based problem solving (engineering) over pure knowledge (where we are at a competitive disadvantage with many university clusters around the country). Facilitating man's progress through innovative problem solving. Addressing the 14 Grand Challenges of Engineering and inspiring our kids into STEM careers through those challenges. Building on two of the most famous Houston quotes from the Apollo 13 mission: "Houston, we have a problem" and "Failure is not an option" - the greatest single instance of problem solving in Houston's history. What aspirational message would we be sending our citizens? (vs. other cities): "You should be solving bigger problems." Part of this strategy includes tourism, articulated in more detail here. We need the big tourism experience of other world class cities, and STEM is a unique niche we can build around, with a primary focus on families, schools, and STEM-related conferences. We already have some of the assets in place - JSC and Space Center Houston, the Natural Science Museum, the Health Museum, the Children's Museum, Moody Gardens - and others with more potential, like the Texas Medical Center. 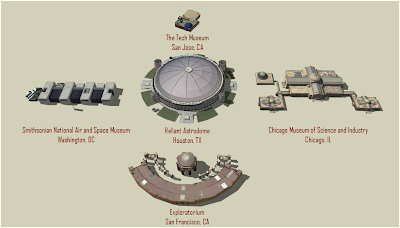 But we need that signature attraction: the world's largest institute/museum of technology. Not just a history-focused museum, but an institute actively involved in the community with a strong focus on the future. Local kids should spend frequent school days and summer camps there on fun and inspiring STEM activities. It could provide educational STEM experiences both online and on-site, helping to attract talented global youth to Houston for amazing experiences that draw them back later for college or after graduation. It should have the world's largest hackerspace. It should be an inspiring space that attracts global academic and professional STEM-related conferences (building on the OTC) - groups trying to solve big problems and contribute to humanity's progress (imagine a Davos or G8 of STEM...). Each conference could leave behind a new exhibit on its subject area, building the collections over time. And since it has the event space, we might as well open it up to festivals to expose more of our community to that same inspiration. Name? Maybe "The National Museum of Technology and Innovation"? We could even get it officially certified by the Smithsonian, which is now allowing national museums outside of DC. But unlike every other museum in the world where exhibits are carved up into a series of halls, almost all of them could be visible in a giant 360-degree panorama while standing on the floor of the Astrodome. How amazing would that space be? And consider this: at every single Texans home game (and the 2017 Super Bowl! ), the national media would be pointing their cameras at the Astrodome STEM museum and talking about Houston's STEM innovation focus and strength. They would have aerial blimp shots talking about it and even doing interior shots of exhibits for their cutaway footage (you know, the short local background videos when they return from commercials). Our national and global identity would get tied to technology and innovation (in addition to the existing identity around energy), and that would help draw talent and jobs. It would be a *huge* reputation and brand builder for the city. The cost, you ask? Easily in the hundreds of millions. But if LA can come up with $1.2 billion to build the Getty Museum, I have no doubt that Houston can muster the needed resources. It's a tiny fraction of the wealth of Houston's 14 philanthropic billionaires, much less the broader base of wealth in this booming city. We can come together to make this happen before the Astrodome's 50th birthday in 2015, and it can put us on a path to greatness for our bicentennial in 2036 that Houston's and Texas' founding fathers could never have imagined. We, the citizens of Houston, aren't the types to get complacent and rest on our laurels. That's not the legacy previous generations left us. It's time to step forward and tackle our next great challenge. Are you in? Happy 7th anniversary! Sorry it took me so long to discover the blog, but glad I'm making up for lost time! For someone who stands astride monstrous infrastructural boondoggles (rail transit comes to mind) and uses his bully pulpit to shout, "Stop!" you sure come off hypocritical in your incessant bleating for this STEM museum. I anticipate you pointing out that METRO Solutions is paid for with public dollars whereas you are advocating for the use of private dollars to facilitate this museum; to which I say: a boondoggle is a boondoggle whoever the fool that pays for it. I'd rather see $1.2B spent to lure Disney to FINALLY build a megapark for the Central/South US. I could elucidate the reasons (just as you probably could) why this is a gargantuan economic opportunity for all of the stakeholders (city, the state, Disney (or whoever your preferred developer is), but it couldn't sell itself any easier. Beyond that, and more to YOUR point, I'd rather see $1.2 billion go to buy up half the empty parking lots in downtown Houston and build a Tier 1 flagship STEM university from scratch, with endowed chairs to lure the best applied STEM professors and researchers here, so that we literally have big oil/energy/industry next door to the brightest minds in the industry. And we instantly change the urban environment of Houston for the better. Sorry if my initial critique came off rather harsh, but I'm a fan of yours and just can't fathom the plausibility of this idea you've been promoting for a while now. Keep up the good work! Investments should be made in infrastructure that generates returns. I don't feel this is the case with (most) light rail or HSR. I think human infrastructure via education most definitely can. Dr. Klineberg at Rice has been calling for this very thing for a long time. Disney would be great, and would certainly generate tourism economy, but wouldn't upgrade our talent base. And, besides, my understanding is that they've said very clearly in conversations with them that they're focused on international growth. I'd say invest in Rice or UH upgrades before creating a new STEM university, although it's funny you should mention that because my first content post on the first day of this blog 7 years ago proposed an elite sister campus next to UH, the Houston Institute of Technology. Could still be a good idea, but I don't see UH going for it. Universities also require ongoing subsidies. This STEM institute/museum could be operationally self-supporting after the capital outlay. And if it can inspire and guide even a small portion of the Houston region's kids into STEM fields, it will pay for itself many times over. Yeah, on further considering the idea, I'd agree with you that the idea say that UH/UT creates some sister type institute would make more sense, but that they probably wouldn't go for it. And on the ongoing operational costs...this is true and I meant that the $1.2B goes for initial campus/facilities construction and hiring NAS/E fellows and then yeah.. you're looking at the Legislature funding this center as an ongoing investment in Texas' future. With Disney my thinking is very macro in that the overall boost to the economy creates a positive feedback loop that trickles into everything from more tax dollars for more livable neighborhoods which acts a secondary attractor for creative class types to more tourism which again in a roundabout way raises Houston's intellectual/business visibility to people who'd normally not ever interact directly with our region. I guess I'm more than anything else just skeptical that STEM as a tourism driving concept itself can compete with the superficial and widespread appeal of Empire state buildings, Eiffel towers, or even (thinking more in our city class)the Magnificent Mile and the Chicago art institute. As an exercise in hypothetical situations, I propose to you the Sears tower having been built in Houston as an example say in 1981. That moment, that building--in Houston at that time--might've been the sort of project that could have condensed what Houston is and looks like for a global audience and might have projected a specific urban vision for what Houston ought to be for the last 30 years. From a tourism stand point it would act as 'the thing' people go to see when they go to Houston. A STEM museum/institute seems in my mind destined to remain in the category of 'regional attraction' because it just doesn't have that instant cachet about it that unique entertainment venues or iconic architecture or massive zone destinations (times square, champs elysee etcetc) seem to have. Is architecture the answer to Houston's image and vision question? I'm not sure that it is.. the market seems to think that as an image of American power its time has passed. My personal dream has always been the redevelopment of the bayous. Some of the master plans that have come out over the last 100 years have been very exciting, but we as a city lack the spine to make the capital investment. I didn't mention the bayou investments in the post, but they are a key initiative of the city now, and they will be a very good thing if they get traction. The National Air and Space Museum is the #2 most visited museum *in the world* - and, to be honest, I think we can be as good or even better with the right investment. I agree this won't put us anywhere near the top-ranked tourist destinations, but I think it will give us a much higher profile than we have today. Combined with our other assets, I could definitely see families and schools scheduling trips here just like they do today for DC - because it will be an important educational experience for their children. And I also think that what the top 10% of families do today (in terms of educating their children) will be adopted by the upper half over the next few years as education becomes ever more critical to secure good jobs. You can already see it in college attendance growth. What might be a niche tourism strategy today could be very mainstream in 10 years. And don't forget the tourism is only one of the benefits. The other is the educational benefits to hundreds of thousands of local school children, which upgrades our talent base and makes us a much more attractive place to do business. It's easy to just think of it as just a "big museum", but what I'm talking about is much more than that in terms of interaction with the community. I'm glad you commented like this. Because, after all, what is everyone's favorite part of the Space Center learning experiences? It's looking over NASA's shoulder, of course. None of the other education is half so grounded without that little chance to see what's afoot in the actual workspace. It has been a puzzle to me how to make STEM itself that involving. But surely once we have an answer then the Dome will be the place for it. Exhibits alone lack all but one thing that is enthusing about the real thing, don't they? Business and sports should require subsidies if there weren't willing customers for the process: the Houston Institute should be a place that active research welcomes the public. Neither university nor crowd-sourced, but a new face for the medical center and the city. As a private citizen, I would like to do more than just think about this. What can I do with my time? *but it also must fit mankind; don't forget C.S. Lewis' The Abolition of Man. In a nutshell, the lecture is about the value of education. It points out that magic and applied science were born together around shaping the world in accordance with ourselves, in place of earlier education, which had been around shaping ourselves in accordance with the world. With this shift enters the possibility of taking ourselves and our ethics as two more things to engineer: something which science must rise above by means left to us to discover in objective moral bases. There is room for the whole of education to ennoble here in Houston. > As a private citizen, I would like to do more than just think about this. What can I do with my time? Great! A loose team is forming to push this forward. Email me at tgattis (at) pdq.net if you'd like to get involved. I think this is a fantastic idea, albeit with plenty of challenges. I think as a model, in addition to the Smithsonian and Chicago's MSI, we should look at Munich's Deutsches Museum. It's essentially Germany's national science and tech museum. I once visited it in the same month that I visited Smithsonian's National Air and Space and, to be honest, my patriotism was a bit humbled. The Smithsonian has plenty of "wow" displays like space capsules and X-15's, but lags sorely in the educational area. At the Deutsches I could visit the mining section and really learn how minerals come out of the ground, then walk through mechanical power and see the transition from giant steam engines to diesel and gas, then go to chemistry and see the step-by-step development of the microscope, all with intricate exhibits. At the Smithsonian there was maybe a third the number of informative exhibits, and the other 2/3 was big plastic games so the kids could play see-saw with their little brother and supposedly learn what a lever is, or roll a penny down a funnel and find out about the curvature of space-time. I admit there's some place for that stuff, but I think they've struck the balance a little too far in the direction of dumbing things down. Of course, then you have Space Center Houston... I think we can do better. Absolute agreement, Mike. The Deutsches is our closest model/example, but we used U.S. comparisons because comparable metrics were a little easier - and they're more familiar to our audience. I was in Munich in the late 90s and saw it - absolutely amazing.